The Lana Natural Mini stuffed animals are the perfect 'take everywhere' toys. They are petite, so they can easily fit in mom's purse, the diaper bag, or the stroller. There is even a small loop on their head for hooking them onto something. 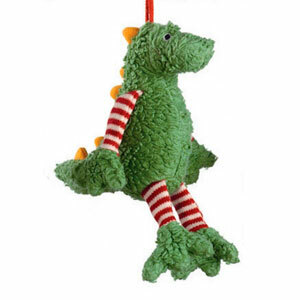 With its ultra-soft body and swinging limbs this Lana Organic Stuffed Dragon makes a funny friend for little ones. Made with 100% organic cotton and filled with pure wool, this toy is naturally non-toxic and so much fun! Washable. Approx. 8" long. LANA specializes in 100% ecological, untreated merino wool and organic cotton from Holland. LANA is known for their European style and old-world craftsmanship. LANA products are so good, they stand the test of time and should be able to be passed to the next generation in your family.